Utah Gov. Gary Herbert has signed a bill that approves $53 million in state funds to aid construction of a new Oakland cargo terminal that backers hope to use to export coal. Herbert on Tuesday signed legislation authored by Republican state Sen. J. Stuart Adams that would help finance the project so Utah coal and other products reach overseas markets more easily. Herbert's spokesman linked the governor's support for the bill to the national political debate over the future of the coal industry. "Gov. Herbert is alarmed to hear the comments from presidential candidate Hillary Clinton when she said 'We're going to put a lot of coal miners and coal companies out of business,'" the spokesman, Jon Cox, said in a statement to KQED. Cox was referencing remarks Clinton made earlier this month when she emphasized her commitment to policies that promote renewable energy. "Utah will continue to pursue an all-of-the-above approach to energy development including one of, if not the largest, growth of solar development in America over the past two years," Cox said. The terminal and Utah's role in financing it has outraged local environmentalists who have been working to stop the project. 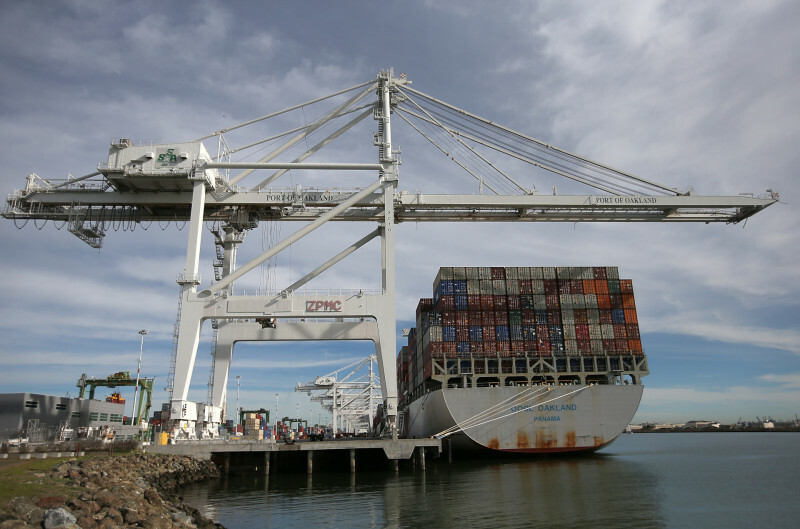 They say it will increase air pollution in West Oakland, which already has high asthma rates. "They're already experiencing a lot of health effects, so to bring a project that can worsen the effects of residents and potentially the workers -- we're opposed to that," said Brittany King, a conservation program coordinator at the Sierra Club's Bay Area chapter, in an interview. Critics also say the project perpetuates dependence on fossil fuels, contributing to high levels of carbon dioxide in the atmosphere that scientists have identified as a key driver of climate change. "I'm deeply disappointed in the decision by Utah's lawmakers to use public funds to prop up a dying industry that will only pollute our planet and contribute to global warming," East Bay State Senator Loni Hancock said in an email. But Adams said the project will help in the global environmental battle. "Utah has the cleanest coal on the planet," Adams said in an interview earlier this month. "You actually may be improving the environment by allowing this." Adams said if India and China burned more clean coal from Utah, the earth's environment could get better. "As long as the rest of the world is using it, you ought to use a better product than dirty coal," Adams said. One of the Bay Area's top energy experts disagrees. "There is no such thing as clean coal," said Daniel Kammen, a UC Berkeley professor of energy and co-director of the Berkeley Institute of the Environment, in an email. "When you burn coal you get carbon dioxide, no getting around that. Poison is poison. Adams is wrong." "Burning coal with less trace toxin elements in it is better than injecting it into a vein, but far worse than the many clean energy options that are available," Kammen said. Adams said California should return favors that Utah has done for the Golden State in years past. "When there were power generation lines that needed to be run through Utah from Wyoming to California, we allowed those lines to be run through," he said. "Most of the goods that come from the rest of the world come into California and travel through Utah through our freeways, with trucks and whatever else may pollute our air. And we've actually tried to accommodate California, tried to be neighborly."